In warmer weather, I got a lot of use out of two pairs of lightweight Simms pants (not pictured). One pair was the Flyte pants and the other was the Bugstopper pants. Both were from an older line and have since been discontinued. I didn't buy the latter for its bug stopping ability so much as I liked the look of them. Both pairs were very comfortable, both in and out of waders. A big plus is that they both looked like fairly normal pants, so I was fine with wearing them around town either before or after fishing. Actually, I liked the fit enough to wear them around when I didn't plan on fishing. I'm sure new models have replaced those which are discontinued. I would buy either again (or their new equivalents). In the fishing clothing department, the best purchases I made in 2014 were Simms Coldweather pants and Coldweather shirt. Along with my Islander reel, the Coldweather pants were the best purchase I made all year. Both are lined with textured fleece and are really warm. The pants are especially warm. By themselves, the Coldweather pants were warm enough for most days. I didn't bother wearing a base layer under the pants unless I knew it was going to be really cold. Another nice feature is the velcro cuffs. Just cinch up the strap and there's no need to worry about my pants creeping up my leg inside my waders. I used to use velcro-backed neoprene straps to prevent the leg creep, but the built-in velcro straps worked well enough on their own. The Coldweather shirt was really nice as well, though not a total knockout like the pants. It's not like there's anything undesirable about the shirt so much as I've found the layering on top easier to do than on bottom. If anything, I think the shirt looks better on its own than the pants do, though it's nothing I'd want to wear indoors for too long. The fleece lining is quite warm. I'd buy either again, especially the pants. I'm sort of a pack junkie. I don't really want to be. I just want to find the system that's right for me. I'm still searching for the ideal setup. The first packs I used this season were the new Simms Headwaters sling pack (not pictured) and the Headwaters large sling pack. I used the former mainly for trout fishing. My first impression was that, when it was worn on my back, it was much more comfortable than my old Orvis sling packs. Of course, that might be because the Simms pack came with a waist strap*. It wasn't too bulky, but it was big enough to hold all I needed for a day on a trout stream. The Headwaters large sling pack is pretty much the same pack as the regular one, just a lot bigger. I used this pack for salmon fishing. It has an extra large compartment, but no water bottle section like the regular pack has. I don't know how I feel about the large pack. I think it was too big for me. I might want to carry a lot of stuff with me at one time, but there's no reason why I need access to all of it all the time. Sure, the pack was more comfortable than my old Orvis Magnum sling pack*, but it is less comfortable than a backpack. I think I'd rather use a smaller pack for a couple fly boxes and throw everything else in a backpack. Here are my main gripes with both packs. I don't need so many places to store forceps or pliers. I don't really know of anything else I can keep in those black sheaths, so having three seems kind of a waste. Plus, I didn't really trust the magnet in them. I sort of expected my forceps to slip out (though they never did). What I could use is a couple d-rings or attachment points for whatever I want to attach. Even more velcro would have helped out. The packs look nice and streamlined, but I'd trade looks for added functionality in a heartbeat. I don't like the fold-down "workstation." I didn't wind up using it as intended. It's a good idea, but a full pack sort of gets in the way, especially in the larger model. It's too much to get my arms around just to use the workstation. I'd rather have an empty compartment for fly box storage. Or line it with better velcro so I could stick things to it. I didn't want to keep my tippet spools on the outside of the pack. The velcro didn't stick well on the inside and they slid all over the place. Despite all the features, which I'm sure a lot of thought went into, these were both just packs to me. They're just a place to store things. I didn't feel like either made my life any easier. Because of the lack of outside attachment points, I feel like they actually made my life a little trickier. I like having access to gear on the outside of the pack so I'm not constantly zipping and unzipping. I'll probably keep the small pack and use it for trout fishing next season, mainly because I already own it. I doubt I'd use the large pack again. I think I'm just not too into sling packs. All that rotating around my upper body gets annoying. I tried two small, no-frills William Joseph packs this season. The first was the William Joseph Eddy. This is no more than a water resistant shoulder bag. It's not really much more than a pouch. Like the sling packs, a couple of attachment points or velcro would have been nice, but no big deal. This pack was made to be pretty basic. The front pocket was small and hard to get my hand into. I think I used this pack once or twice. It didn't really work for me, though it might make a good pack for my night fishing gear. It was inexpensive, so I'll keep it and find a use for it. I might use it as a travel fly tying bag. The second pack I tried was an older William Joseph hip pack. This was the first time I've used a hip pack. I liked it. In the course of a day, this pack would loosen and slide down my waist, but it has no shoulder strap to help keep it up. This particular hip pack is pretty basic. The zippered compartments on the belt were a nice touch. Overall, it was more useful than the Eddy was. It's a pretty small pack, but it worked well when used in conjunction with a backpack and/or wading jacket. I think I want a little bit more from a hip pack in the future, but this one wasn't too bad as long as I kept it light. Rotating a sling pack got on my nerves this season, but rotating the waist pack didn't bother me as much. I'm in the market for a new hip pack for next season. I like the hip pack/backpack combo best of all so far. 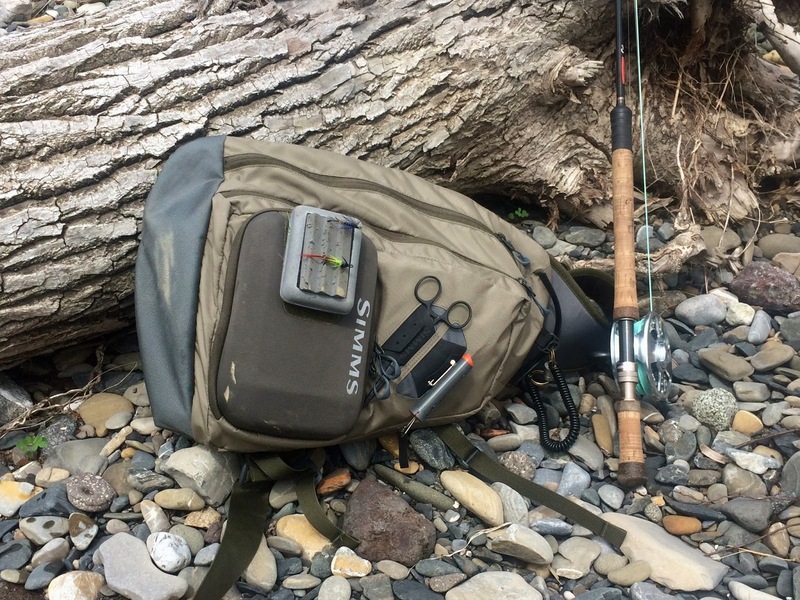 I have been using a Simms Dry Creek day pack, but it's sort of small. I might look into getting one of their new Dry Creek backpacks. Instead of trying to cram everything in one pack and carry it on me at all times, I'd rather carry the essentials and leave the rest on the bank. The Simms clothing is good stuff. It's pricey, but there are always deals to be had in the off season. I might try to pick up some more Coldweather gear if it goes on sale in the spring. *My old Orvis sling packs didn't come with waist straps, though they came with buckles for them. I contacted Orvis to get a replacement waist strap. They offered to send one at no charge. They never sent it.